The most powerful type of pressure washer is a gas-powered one. However, a gas pressure washer's powerful spray can more easily damage materials like wood and auto paint. In addition, as with any gas-powered tool, these models need regular engine servicing. Among gas power washers, the Simpson MSH3125-S MegaShot (Est. $400) scores highly among reviewers. It's an Editors' Choice winner at Family Handyman. "The beauty of this machine is its simplicity," the editors say. "The pump connections are higher off the ground and out in the open, making this machine the easiest and fastest to set up, especially if you have knee issues or have trouble bending over." The Simpson is a runner-up gas pick at Your Best Digs. The reviewers were largely impressed. "Its design, build quality, and components were all excellent," they say. Water output wasn't the highest tested, but it was sufficient "to handle just about any cleaning task at home." What holds the Simpson out of the top spot there is a problem with a leaking carburetor and indifferent customer support from the manufacturer -- and by the time the motor was inspected, the issue had disappeared. Your Best Digs isn't the only expert to run into customer support issues either, with Pressure Washer Critics thoroughly dinging that aspect of this pressure washer, but still giving it props for both performance and value. Otherwise, most expert and user feedback is strong. The Simpson MSH3125-S MegaShot earns a recommendation from Pressure Washers Direct's Brian Teitelbaum, who calls it "a very versatile pressure washer at a very reasonable price." User reviews at that site are also generally positive, and it earns a 4.52 star rating from the 420 owners that weigh in. Home Depot hosts more than 1,360 reviews -- though that includes feedback from the manufacturer's site, and the pressure washer earns a 4.3 star score. Rated at 3,100 PSI, with a maximum water output of 2.5 GPM, the MSH3125-S is ruggedly built, with an ergonomic spray gun with a safety lockout. The spray gun can accept one of five included stainless-steel quick connect nozzles. Accessories can be conveniently stored on board, and the 10-inch tires make moving this Simpson pressure washer around a breeze. The pressure washer is covered for one year, with a second year of coverage for the well-regarded Honda motor. Accessories are covered for 90 days. The Simpson MSH3125-S is an especially good choice for California residents because it is CARB compliant and can be sold in that state. We also saw some fairly strong feedback for the Ryobi RY802800 (Est. $350). It's a little cheaper than the Simpson, and a little less powerful, though at 2,800 PSI and a maximum water output of 2.3 GPM, it's still more than powerful enough for homeowner use. In addition, those ratings have been tested and certified as accurate by the Pressure Washer Manufacturers' Association (PWMA Standard PW101). Like the Simpson, it's powered by a Honda motor, and is CARB compliant for use in California (and all 50 states). Experts largely give the Ryobi pressure washer props. It's the subject of a lengthy review at Pro Tool Reviews. There Kenny Koehler says that "This Ryobi 2800 PSI Pressure Washer is ideal for any homeowner or property owner that's looking to keep concrete and wood surfaces clean along with building exteriors and vehicles." Though Consumer Reports does not recommend any gas-powered pressure washers over safety concerns (due to the type of wands and nozzles they typically use -- see the Introduction to this report for more information), the Ryobi finishes near the top of their ratings. "This gas-powered pressure washer from Ryobi delivered powerful, effective cleaning, plus other welcome pluses," the editors say. This Ryobi pressure washer is primarily sold at Home Depot, and user reviews there are both ample and strong. It garners a 4.5 star rating based on more than 1,630 reviews. Around 93 percent of owners recommend it -- which is about as high a percentage of satisfaction as you'll find among gas washers with lots of user feedback. The gas pressure washers profiled above are consumer units. They might be suitable for use by some painting and other contractors, but for heavy-duty, long-term performance and reliability, a commercial pressure washer is a better alternative for most. Commercial pressure washers are ruggedly built and offer a higher cleaning factor than even the most powerful consumer pressure washers. While most consumer pressure washers are subject to shorter warranty terms when used in commercial applications, professional pressure washers are usually fully covered for commercial use as well. Feedback on commercial pressure washers isn't extensive, but we saw some good reviews for the Pressure-Pro Professional E4040HC (Est. $1,380). 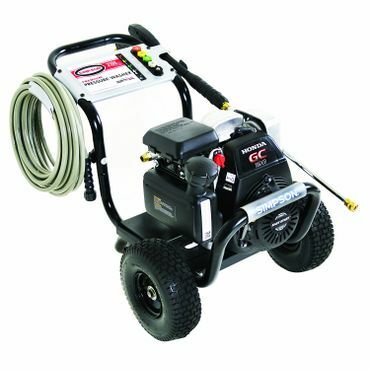 This is a super rugged, high-power gas pressure washer, rated to deliver 4,000 PSI and 4.0 GPM. It features a Honda GX engine and a CAT Triplex Plunger Pump, which is judged to be more durable than the axial pumps typically found in residential models, including the ones highlighted above. It's built on a weld-free, aircraft-grade aluminum frame, which carries a lifetime warranty. The engine is covered for three years; the pump for two. Accessories, which are covered for 90 days, include 50-feet of steel re-enforced, non-marking hose and a spray gun that can accept the five included quick-connect nozzles. Brian Teitelbaum at Pressure Washers Direct says that the Pressure-Pro gas commercial pressure washer is "an excellent professional pressure washer choice in this price range." His site is where we also spotted the most user feedback, nearly 100 reviews, with an overall rating of 4.76 stars and recommendations from 94 percent of owners. At Amazon, we saw around 20 additional user reviews, with all but one owner giving this gas pressure washer a 5-star rating -- and that was with issues with the shipper, not the pressure washer, which he describes as "great". It's CARB compliant, so it's another good choice for California residents. A power level that suits your needs. Maintenance requirements you can handle.